A world traveller, Sharmini finds most of her inspiration in the varied cultures of the world. Her works do not simply replicate motifs and symbols of ancient and modern civilizations; instead they are expressed by her unique vision in a way that evokes and celebrates them. Sharmini has travelled extensively to Mexico and is always awed by the beauty she sees there. After closely studying the design motifs of the Mayan culture, Sharmini created this magnificent wall hanging that pays homage to ancient Mayan art, while simultaneously revealing her own artistry. 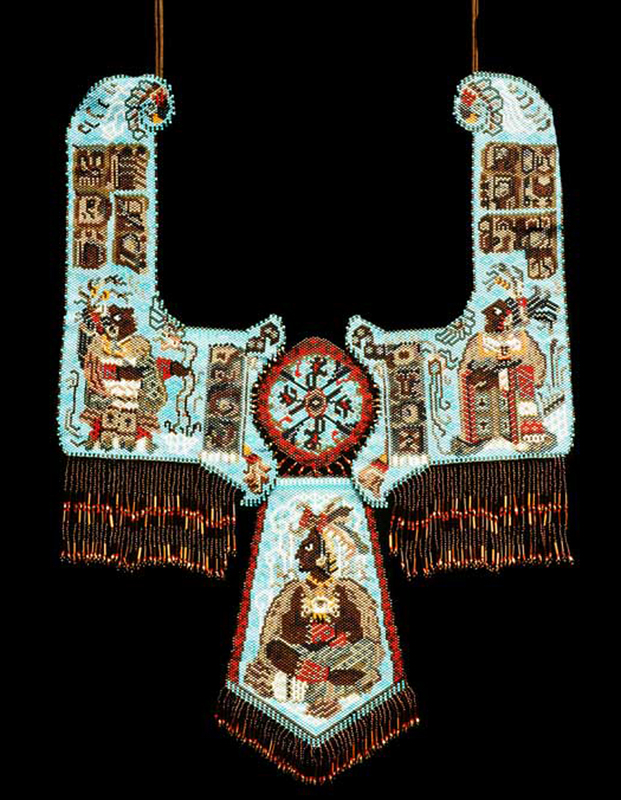 The proportions of The Maya suggest that it could be worn by a high priestess in a Mayan ceremony. The imaginative composition is framed with a long vibrant fringe, conjuring the feeling of ritual and ceremony that is also expressed within the imagery. The design of a new piece begins with researching the theme and creating multiple rough sketches. Once the design is finalized, Sharmini makes a paper model of the piece. The dimensions of the model are then translated into beads per inch and the design is drawn on special beading graph paper. Pattern is filled in using coloured pens. The beads are then selected and the beading begins. Beads are woven following the graphed pattern horizontally, using relevant beading technique. Sharmini favours working with a particular Japanese cylindrical glass bead called “Delica”. Approximately 300 of these beads make up a square inch of woven area. The design is often woven in separate sections and then joined. Accent beads and fixtures maybe added on.